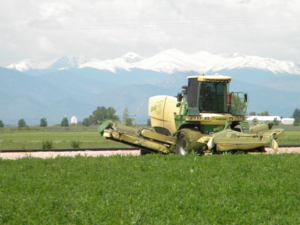 In April 2015, Martin Marietta Materials (MMM) submitted an application for a Use by Special Review (USR) permit to Weld County asking to build a major aggregate processing facility on WCR 13, ½ mile south of its intersection with US 34. This facility would introduce heavy industrial activities to this agriculturally zoned land. all aggregate would be brought to the site by train and delivered onto a 7,000 foot long rail spur. Over 150 trains per year would be required to deliver sufficient aggregate, most of which would be in the summer, resulting in a train every day for months. According to MMM, each train would require as much 8 hours to unload. All of this activity would support the aggregate industry in Wyoming. An aggregate processing facility with these activities, at this magnitude, creates serious problems for nearby residents and small businesses. 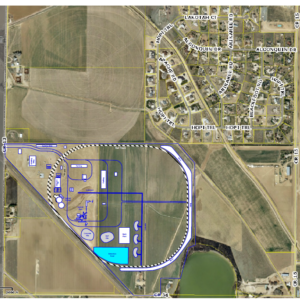 The facility is not compatible with surrounding land uses; will introduce safety hazards by adding large amounts of truck traffic to an already busy highway, creating a fire hazard, and generating small particulate pollution; will destroy quality of life for residential neighbors by generating high noise levels, hazardous dust, and unpleasant odors; will reduce nearby property values; and will destroy nearby small businesses, including an organic farm that grows herbs for pregnant women and a wedding venue. For more than three years, CLR-34 NA has been fighting to prevent MMM from proceeding with the facility. To learn more about the long fight, follow the links below to read about MMM’s USR application and its approval, the neighbors’ opposition to the application, and the court appeals challenging the approval. You can also use the dropdown menu under Martin Marietta Hwy 34 Project to navigate to information about each stage in the fight.